Raquel Figlo of Rock N Roll Industries Magazine recently conducted an interview with MEGADETH mainman Dave Mustaine. You can now watch the chat below. MEGADETH's latest album, "Super Collider", has sold 70,000 copies in the United States since its June 4 release. The CD arrived in stores via Mustaine's new label, Tradecraft, distributed by Universal Music Enterprises (UMe). 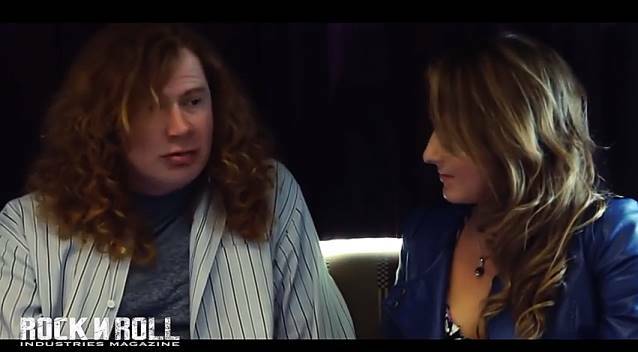 In a recent interview with The Rock Pit, Mustaine stated about the current lineup of MEGADETH: "I think if you ask any of us, they will all tell you this is their favorite period and the great thing is with Chris Broderick (guitar) being around for a while it's pretty significant with him. and Shawn Drover (drums) has been around longer — he's seen more — but when we got David Ellefson (bass) coming back in and he's saying this is the best that he's ever seen it and he's the one that's seen some pretty big successes among us in MEGADETH so for him to say that just shows you that things are on the rise for MEGADETH again. I'm totally excited." Regarding the songwriting process for "Super Collider", Ellefson told Metal Insider: "We worked with [producer] Johnny K on the last record, so we already had the getting-to-know-each-other experience on that record; that was kind of the first date and this was more digging into the songs on the record and had a good idea of what we were going into when we started it. And, really, the songs were laid out in October and we did the 'Countdown To Extinction' 20th-anniversary tour, and by the time we were ready to start tracking at the end of December, we had a good road map of where we wanted to go and there were a lot of tunes that were already on the deck and ready." He added: "We're a band now that is always on tour, so we always try to find little windows to make records in between. [laughs] So yeah, we were already laying out the record during the last world tour. And we knew once we were rolling off the road that we were going to go in and start tracking. January gave us the opportunity to write about six more tunes, which also included bringing in the cover song of [THIN LIZZY's] 'Cold Sweat'."